Well crud... I should have posted my story about NT here. SO sorry! I'll save all my other cat stories, and some pics, for here. 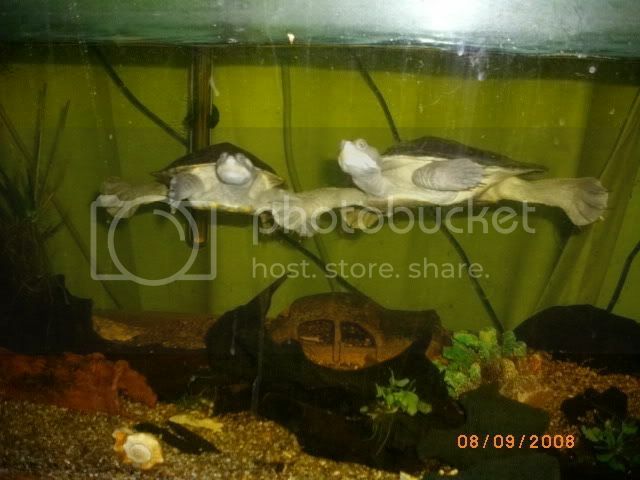 Two turtles........who live in a six foot fish tank, which used to be the home for our fish, but as fish and turtles dont live happily together, we took our fish into our pet shop to be sold, and adopted the turtles. Oh, we are also now the proud parents of two blue tongue lizards as well, another present from our prodigal son. Awww, I love blue tongue lizards. Yes they are gorgeous.....and hes had them since they were babies, so they would not survive out in the wild. They are not very active at the moment, still having their winter sleep. Apparently they like eating snails, so now we have to search around the garden for those. Its amazing, when you want bloody snails, there are none around. We had a couple of BTLs lived in our back yard when I was a kid, Sue, and remember they used to love eating apple cores and banana skins. So, if there are no snails around, head for the fruit bowl, haha! Yes, Kerry we give them banana and celery too. Heres something that came to my notice the other day....I was talking to a friend in America and told her that we have silk worms in the pet shop now, and she did not know what they were. Has anyone from over there, ever had silk worms when they were kids? They feed on mulberry leaves, and spin cocoons of silk. Thats about all they do, but most kids I ever knew here, had some silk worms at some time during their childhood.